Surprised by a wild elephant during the exhumation of the body of a dead Veddah. The Graphic, November 26, 1887. Knox has a wonderful picture captioned as "A Veddah or Wild Man" with his bow and arrow and dagger, smoking a huge pipe and wearing a thick loin cloth. He then goes on to describe the tame Väddas who owe service obligations to the king, especially tusks, honey and wax and deer's flesh which they bring to the gabadage or royal store-house. In Knox the fundamental distinction is between wild and tame based, we now know, on a primordial European distinction between nature and culture, the wild ones living in a state of nature without the benefits of culture.4 Hence, says Knox, they are also called Ramba-Väddahs or hairy Väddas who, as children of nature, "never shew themselves. "5 He had fleeting glimpses of them when he was running away from the Kandyan kingdom, but he could not possibly have had a close look. Consequently, Knox's representation the wild Vädda must be seen as a product of his fertile imagination as he conveyed it to the engraver of his text. But what is the significance of the caption "Wild Man"? I suggest that Knox invented this portrait of the wild man because that is something his late 17th century English public expected to hear. Neither Knox nor the later scholarly endeavors on the so-called primitive peoples can be understood outside the larger European context of the fascination with the "wild man." Richard Bernheimer in his book, Wild Men in the Middle Ages has beautifully documented this European obsession. Hayden White, and more recently Roger Batra, has recently reexamined this topic.6 And Margaret Hodgen has demonstrated that after the so-called voyages of discovery, the human monsters and wild men of the European middle-ages was being foisted on the savage, on occasion providing a rationale for the extermination of native peoples. When Columbus traveled into the new world of the Caribbean, he did not find any monstrous beings. 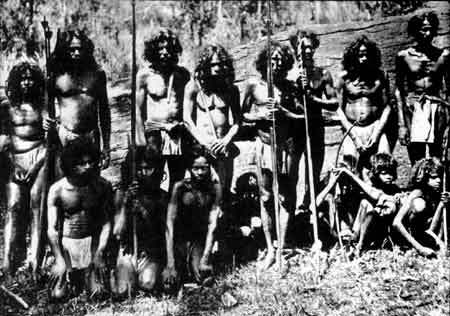 Yet he had hesitant references to Amazonians, to a tribe without hair and, in another interesting European representation of wildness, to tailed men or homo caudatus in a remote part of Cuba.7 These ideas sometimes affected physical perception: thus in 1560 the Spanish thought they saw giant men in Patagonia which is the land of "patagones" or "big feet. "8 As late as 1765 the English circumnavigator Byron claimed to have seen giants in Patagonia. Naturally the European curiosity was satisfied by the Nilgala headrnen who brought Väddas properly attired as wild men to show them to the European. The Väddas of Dambana were also easily accessible from the Government Rest House at Alutnuvara. The Seligmanns somewhat unfairly called them "show Veddas" because they "have been sent for so often by white visitors that they have learnt certain tricks, which they show directly they see a European. "17 Village Väddas were also not exempt from these performances of what I would call "self-primitivization." Parker notes that photos of village Väddas were exhibited in Kandy to "represent men with wild unkempt frizzly locks; but I have never seen anything of the kind in their own districts, and it is probable that the heads of those who have been so portrayed have been 'made up' specially to increase their wild appearance," a fact confirmed, says Parker, by their Sinhala neighbors.18 Both the Danigala and Dambana Väddas were no longer exclusively hunters; they had for a long time taken to hena or swidden cultivation, even keeping cattle, and lived in close contact with neighboring Sinhalas. In the early part of the 20th century a few continued to use bows and arrows; others had shotguns, while yet others borrowed guns from the Sinhala.19 A picture that appeared in the New York Times sometime ago by Viveca Stegborn, a Vädda rights activist, showing Väddas of Maha Oya carrying bows and arrows and in a stalking posture must very likely have been posed to convey the idea of "indigenous people" living close to nature and now being threatened by extermination - a hugely successful ploy as far as the UN committee on the rights of indigenous people were concerned. Today's Väddas, unlike their predecessors, are abysmally poor archers; I can vouch that for a fact from our personal knowledge of them in the field. It seems the Väddas of Dambana and Danigala (no longer a Vädda enclave) had taken over the persona of the wild man expected of them by the European. Theirs was a mimesis of savageness: half naked, carrying a bow and arrow and displaying its uses, gruff, morose, distant and glum. Some colonial observers even said that the Väddas did not have a language; others that the Väddas did not laugh. All this was simply a phenomenon of Väddas acting the wild man role, but done so well as to fool Europeans; and I am sure that Väddas, like good actors, enjoyed playing that role. Thus the Vädda as a "wild man" was being created for the European by the not-so-wild Väddas. Soon this image was being perpetuated for those Sinhala middle class people who, in their own mimesis of colonialism, have imbibed much of the Vädda mythology created by the European. I have seen Dambana Väddas during the 1950s and 1960s line the road to Mahiyangana carrying their bows and arrows waiting to perform their act of wildness, at which they were now past-masters. They also demonstrated to the awed Sinhalas the nature of their strange language, now known as vädi basava or "Vädda language," helping thereby to further distance Vädda from Sinhala. Today both Sinhala and foreign tourists line up to take photographs of the present Vädda chief, a lone symbol of a vanishing primitive "tribe," along with fellow "aborigines" or ādivāsi in his own no-longer-very-primitive environment. Given their interest in the "real" Vädda, one would have thought that the Seligmanns would be able to deal with them at length, but there weren't many left. The Danigala Väddas were physically pure but culturally Sinhala; and the Kovil Vannamai were "badly off and in varying conditions of ill health and malnutrition." The Seligmanns report that "after visiting so many decaying or degenerate communities a refreshing state of affairs was found at Sitala Vanniya." This was the only group that represented both physical and cultural integrity but unfortunately for the Seligmanns there were only four families left!24 It seems that the Seligmanns' construction of Vädda culture and society was based on these four families supplemented by imaginative reconstructions of "genuine" Vädda culture from the other groups they visited. They could not for a moment recognize that those not-so-pure, play-acting Väddas who lived by pastoralism, swidden (hena) cultivation and hunting might have important information on their own life-ways than those poverty-stricken hunting and cave dwelling Väddas they studied for their ever-elusive purity of blood and culture. Robert Knox, An Historical Relation of the Island of Ceylon, Glasgow: James MacLehose and Sons, 1911 . Ibid., pp. 98-99; James Brow, Vedda Villages of Anuradhapura, Seattle: The University of Washington Press, 1978, p.13. Ibid., p.101. Ramba is derived from the Vädda word, rombio, according to the Seligmanns and is related to the Sinhala loma, "hairy." See C G Seligmann and Brenda Z Seligmann, The Veddas, Cambridge: Cambridge University Press, 191 1, p.437. I am however not entirely persuaded by this etymology but can offer no other explanation except that Knox had to depict the Vädda as "hairy" since this is a characteristic feature of the model that he employed, that of the European "wild man" of the middle ages. "Ramba" in Sinhala means "banana" and the smooth peeled bark of this tree is also called "ramba," as in "ramba torana." A more hairless example could scarcely be found! See end note 6. This literature has been recently reviewed in two important essays by Hayden White: "The forms of wildness: archaelogy of an idea" and "The noble savage theme as fetish" in Tropics of Discourse: Essays in Cultural Criticism, Baltimore: Johns Hopkins Press, 1978, pp. 156-182, 183-96. See also: Mary Campbell, The Witness and the Other World, Ithaca and London: Cornell University Press, 1988. Roger Batra in Wild Men in the Looking Glass, Ann Arbor: Michigan University Press, 1994, has reexamined this topic, though I am not persuaded by his thesis that the European experiences in the Americas lead to the erosion of the idea of the "wild man." Margaret Hodgen, Early Anthropology in the Sixteenth and Seventeenth Centuries, - Philadelphia: University of Philadelphia Press, 1964, pp. 1 8- 1 9. Helen Wallis, "The Patagonian Giants," Appendix iii, Byron's Journal and His Circumnavigation 1744-66, ed., R.E. Gallagher Cambridge: Cambridge University Press for the Hakluyt Society, 1964, p.185. R.E. Gallagher, Byron's Journal, p. 186. Wesley thought that the American Indians possessed no religion, laws or conceptions of civil society and murdered their fathers, mothers and children. Asians and even savage Europeans were not exempt: "What say you to thousands of Laplanders, Samoiedes and Greenlanders, all of whom live in the high northern latitudes? Are they sheep or oxen? Add to these the myriad of human savages, that are freezing in the snows of Siberia ... To compare them with horses or any of our domestic animals would be doing them too much honour." Cited in Margaret Hodgen, Early Anthropology, pp. 366-67. E B Tylor, Anthropology: An Introduction to the Study of Man, London: Macmillan and Co., 1881, p. 164. For a good discussion of these issues, see James Brow, Vedda Villages, chapter 1, "The Ethnological Context", pp. 3-39. Henry Parker, Ancient Ceylon: An Account of the Aborigines and of Part of the Early Civilization, London: Luzac and Co., 1909, p. 44. Seligmann and Seligmann, The Veddas, p. 39. This criticism has been powerfully made by James Brow in Vedda Villages; and more recently in the articles by John Dart, C R de Silva and K.N.O. Dharmadasa in their respective articles in The Vanishing Aborigines, editors, K.N.O. Dharmadasa and S.W.R. de A Samarasinghe, New Delhi: Vikas, 1990. Seligmann and Seligmann, The Veddas, p. 29.